11/28/2015: From what I can tell $130K VP for Collaboration Chuck Triplett is actually going to bring his UO ethics policy to the Senate for debate and vote. You must “make decisions based upon the greater good” and act in “wise, ethical, and prudent manner”, while not “shifting blame or taking improper credit”. 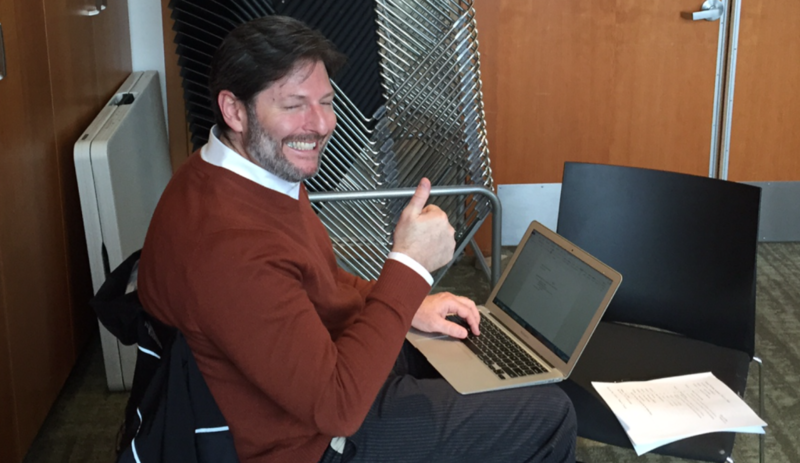 And the administration thinks the *Senate* is wasting faculty time with pointless discussions? “University of Oregon Code of Ethics: All employees must follow the University of Oregon Policy on Freedom of Speech and Inquiry“. Good thing our Johnson Hall bowl game junketeers aren’t sworn officers. That part about “never accepting gratuities” would be a problem. And if you fail to “make decisions based upon the greater good” or don’t act in “a wise, ethical, and prudent manner” or if you engage in “shifting blame or taking improper credit”, you have violated UO policy, and you are subject to university discipline. 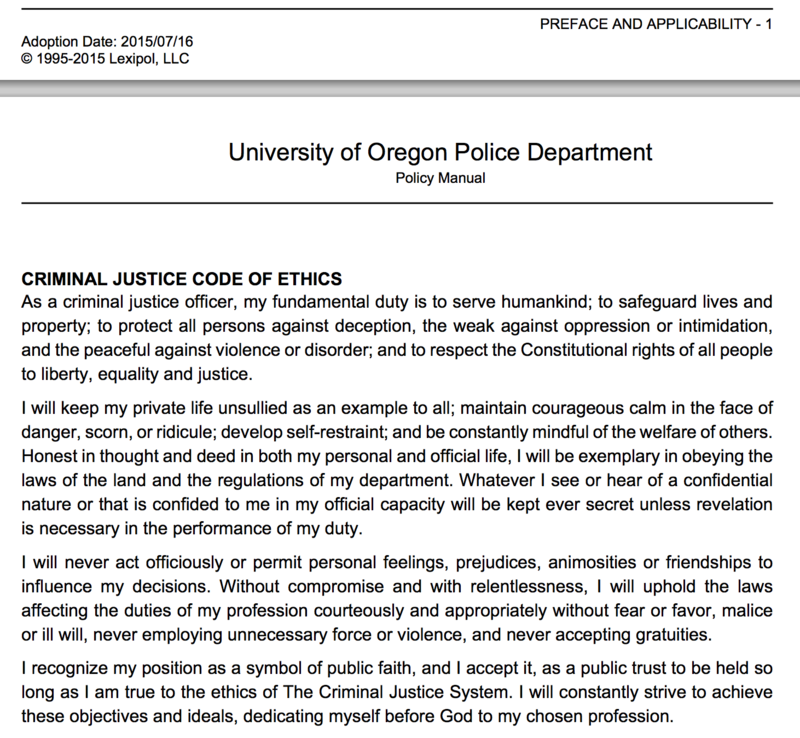 That’s according to UO’s newly revised “Code of Ethics” policy, posted on VP for Collaboration Chuck Triplett’s website, and open for comment here. I’ve got an email out to Triplett, asking where I report a $130K-a-year administrator, hired without an affirmative action compliant search, who fails to “make decisions based upon the greater good”. The University of Oregon has a duty to educate students to be responsible citizens and provide instruction, research, and public service programs that contribute to the maintenance and growth of a healthy state, national, and world economy. All employees, officers, students, and volunteers acting on behalf of the university have a responsibility to work towards the fulfillment of our mission and conduct themselves ethically, with the highest integrity, and in compliance with all applicable laws, regulations, and policies. Honesty and Integrity – We demonstrate honesty in our communication and conduct while managing ourselves with integrity. We uphold the values of this code and make decisions based upon the greater good, conducting ourselves free of personal conflicts, self-dealing, using resources for personal benefit or gain, or appearances of impropriety. Respect – We demonstrate respect towards the rights and dignity of others; show concern for the welfare of others; expect equality, impartiality, openness, and due process by demonstrating equity and fairness without reference to individual bias; and refrain from discriminating against, harassing, or threatening others. Stewardship and Compliance – We utilize resources and information entrusted to our care in a wise, ethical, and prudent manner in order to achieve our educational mission and strategic objectives. We uphold civic virtues and duties by obeying laws and policies. Accountability and Responsibility – We take responsibility for our choices and actions by showing accountability and not assigning or shifting blame or taking improper credit. We act with responsibility by reporting unethical and illegal conduct to the appropriate authorities, including supervisors, management, or responsible university offices, including the Office of Internal Audit, and, when appropriate, external authorities including law enforcement. The UO expects incidences of report fraud, waste, and/or abuse to be reported. Hotlines are available to make reports of fraud, waste, and abuse: 855-388-2710. The Office of Internal Audit will review and investigate as appropriate all reports and, when warranted by the facts, require corrective action and discipline in accordance with policy and law. Employees who make a good faith report of suspected fraud, waste, or abuse are protected from retaliation, in accordance with the Oregon Revised Statute 659. Fortunately UO has a strong faculty union contract that makes most of the silly parts of this code irrelevant – you are in the bargaining unit, right? UO contracted with EthicsPoint, an independent, third-party vendor, to provide this confidential and anonymous telephone and Internet system for reporting concerns. EthicsPoint reports concerns received on the hotline to the Office of Internal Audit, which coordinates investigation efforts of reported concerns in conjunction with necessary campus and external parties as deemed appropriate. Employees who identify themselves and make a good faith report of suspected fraud, waste, or abuse are protected from retaliation, in accordance with (ORS 659A). UO will maintain confidentiality for employees reporting suspected irregularities, misconduct, safety issues, or other concerns to the extent possible under the law. In accordance with ORS 297, the Secretary of State Audits Division http://www.sos.state.or.us/audits/ is notified of all complaints and confirmed losses that are in excess of $100. Tagged Academic Freedom, audits, Charles Triplett, free speech. Bookmark the permalink. This sounds like a document for totalitarian control, no matter how smarmy and faux-noble sounding the language. (Or perhaps especially because it is so smarmy.) Who gets to decide what the “greater good” is? Who gets to decide whether any individuals thought processes have led to “decisions based upon” that greater good? Triplett? Mike Schill? Phil Knight? The local union organizer? The local demonstration out in front of Johnson Hall? If taken with any seriousness, and not just another wasteful administrative throwaway, the document sounds like a template and promoter of the most draconian totalitarian control, with the agent of control left open. Mao’s thuggish agents didn’t do any better 50 years ago. I’ve known plenty of people who lived through THAT who came here (to the U.S.) to get away from it. I guess maybe they should look off-campus to hide from it now. No kidding. Who gets to decide what is “wise” and what is “prudent”? It appears that Triplett’s boss and Triplett’s boss’s boss want this done as quickly as possible. Vague languages always favor the administration. Why? Mike Schill does not want another lawsuit similar to the one filed by Stokes and Morlok. He is going to make all new employees (and perhaps even current employees) sign some type of work agreement that refers to this ethics policy. Most people do not read the fine print. Mike Schill and select members of his team wants total control. It is important the faculty senate discusses this issue thoroughly and give the other unions a heads-up. UO is becoming an autocracy. “We take responsibility for our choices and actions by showing accountability and not assigning or shifting blame or taking improper credit.” LOL. Seriously though, I think I’d be fine with this as a list of values buried on the website somewhere. As a “Code of Ethics” instituted as policy, much of it seems so vague as to be unenforceable, and/or likely to be selectively and unfairly enforced. For UO employees who are unionized, shouldn’t this be a bargaining matter rather than an executive fiat? I’ll screen all comments posted here and forward those that are civil, nurturing, respectful, and free of harassment or self dealing to the University Secretary. Delete all but the first paragraph and it would be fine. Or is there a thousand word minimum? No, I want the Senate to decide. My favorite is: “conducting ourselves free of personal conflicts”. Is this inter-personal conflicts or intra-personal conflicts? Either way, I’m not sure I can guarantee my compliance. You need to file a complaint against yourself. Don’t worry, UO will protect you if yourself retaliates. We all know what happens when we “act with responsibility by reporting unethical and illegal conduct to the appropriate authorities, including supervisors, management…,” The administration to propose an ethics article in the bargaining of the first contract but we ridiculed it so badly they withdrew it. I don’t know what happened with the 2nd contract process. Sigh. Please hire a copy editor, Johnson Hall. On a more substantive note, why would the UO expect this reporting to happen? Nothing good has ever been done in response. The UO expects its employees to waste their valuable time and energy on fruitless endeavors? The UO expects its employees to report waste, fraud, and abuse and get disciplined and fired and thrown under the bus in public? No thanks. Has the promotion of capitalism now become the raison d’être of a university education? Will faculty and departments be evaluated on the basis of their promotion of a healthy capitalist economy? Not a problem for the business school, I suppose. Tougher for the law school, most of whose graduates can’t find jobs in their profession after graduation. Seemingly impossible for the Classics. Will this new policy be used by the university to shut down programs perceived to be anti-capitalist, e.g., the former environmental law clinic. Or to discipline faculty who evince socialist or communist leanings in their teaching or research? This sounds more like socialism than capitalism. On the other hand, given the bad sentence construction, it reads that we are *required* to use “resources for personal benefit or gain.” So maybe you are right. Go help yourself to one of the Tibetan carpets in the football complex. Just say “The old man told me to take any rug in the house”. Is Comrade Stahl conceding that “economy” — especially “healthy economy” — essentially means “capitalism” (or perhaps “market economy,” to use a less loaded term)? We’re going to need a standing Senate committee to administer this Code of Ethics, resolve disputes like this, and administer appropriate penalties. How about calling it the “Senate Unethical Activities Committee”? Obviously we’ll need an economist and a philosopher at minimum, plus some muscle from the athletics department. Any volunteers? old man, I have to wonder, are you willing to live at the level of an average human being in the world until the day arrives when it’s OK to grow the world economy again? I’m sure it would take a good deal of getting used to. It wasn’t easy to quit cigarettes and bourbon, either. In a modern world autocracy, the individuals at the top of the hierarchy exercise total control by writing the rules, applying the rules, and interpreting the rules, especially when challenged. They are direct opposite to the US governmental system, where the legislative branch, the executive branch, and the judicial branch are totally separate. They trick people to think they believe in democratic processes when in reality, they do not. They have open hearings before rules are finalized. However, once the rules are official, the autocrats apply them to suppress freedom of speech. Singapore is a good example. Citizens there frequently are put in jail because of what they say before they have a chance to put anything in action. Certain large corporations also practice it by insisting on a signature on the work agreement. They do not want lawsuits. Many have fond memories of the Hat. He was beloved by the faculty, the staff and the students because he spoke his mind and because he represented every soul on the UO campus so well. Pernsteiner did not like the Hat most likely because the latter challenged his authority and because freedom of speech and openness made Pernsteiner insecure. Do Pernsteiner, Schill, and a couple others on Schill’s leadership team share the same personality traits? Individual readers can decide. In an autocracy, the executives at the top frequently violate the rules themselves. They can because they make decisions in secrecy. The overseers (Board of Directors or Trustees) have full time careers and do not have time to watch every step made by the executives. They executives will continue to put up roadblocks when the media request information via the freedom of information act. Personnel confidentiality is often used as an excuse. These executives easily panic when certain privileged information is or might have been leaked. Recall the episode involving archivist, James Fox. In an autocracy, loyalty is expected of all subordinates. In the matter of Stokes and Morlok versus UO, the top administration to date has not explained why Director Kerr continues to remain in her job. A reward for loyality? Yes? No? It would be interesting to see the results of a quick survey with a number of AAU presidents as to how each of them would have done. I strongly recommend interested readers to apply the four standards in the proposed code (honesty and integrity; respect; stewardship and compliance; and accountability and responsibility) to evaluate some of the actions taken by the current administration. If a violation is found and supported with strong evidence, would the Trustees accept a petition and promise to conduct a thorough investigation in an open manner? A blogger in Portland has one of the best insights. He or she said “This is the last chance for UO. If UO does not get it right, there won’t be an UO.” Freedom of speech is accorded to all citizens in our democracy and carries the highest importance in any institution of higher education in US. It would be very sad to see UO becoming more and more like the universities in certain Asian countries. Disclosure: I am not related to or a friend/acquaintance of Stokes and Morlok. In fact, I don’t know a single soul whose name appears in either the student/staff directories at UO or any of the legal documents shown in this website. I have never worked in the legal industry. I also am not an academic. Anchor my professionalism and sense of ethical responsibilities to views others hold about a supreme being, even if only in part? I work at a research university. Imposing on employees views that presume a supreme being as a condition or expectation of employment strikes me as eminently open to litigation. I cannot imagine that is what is envisioned here, so, please leave it out of employment contracts and guidelines.